Hereford-based archaeologist and co-convenor of the Collaboratory, Dr Keith Ray, has joined the School of History, Archaeology and Religion at Cardiff University, with effect from 1st January 2019. Keith has been awarded the title of Honorary Professor of Archaeology in recognition of his several-decades-long professional involvement in archaeology. Keith’s career has spanned academic and research posts in Cambridge, Nsukka (Nigeria) and Lampeter, as well as archaeology in English local government in Oxfordshire, Plymouth and, latterly, for over 15 years as County Archaeologist in Herefordshire (to 2014). In recent years, he has worked part-time as an archaeological consultant. He has otherwise devoted his time to research and writing, and to voluntary archaeological and historical endeavours (Honorary Secretary of the Herefordshire Victoria County History Trust; Recorder for Archaeology at the Woolhope Naturalists’ Field Club, Hereford). Regarding the linear earthworks and landscapes of the Anglo-Welsh borderlands, Professor Ray is author of The Archaeology of Herefordshire: an Exploration (Logastan Press, 2015) and has lead authored the first modern comprehensive book on Offa’s Dyke, considering in detail its design, placement and landscape context: Offa’s Dyke: Landscape and Hegemony in Eighth Century Britain (Windgather, 2016, with Ian Bapty). Keith’s latest book, written jointly with Professor Julian Thomas, is Neolithic Britain: The Transformation of Social Worlds (Oxford University Press, 2018). At Cardiff, Keith aims to build upon the distinguished tradition of studies in Neolithic and in Iron Age Britain at that institution, as well as to further explore the history and archaeology of the Anglo-Saxon kingdom of Mercia’s frontier with Wales through his research and outreach initiatives. Further information about the venue and event can be found here. Last month, Howard appeared on TV. Having been filmed on location at the Pillar of Eliseg and at Offa’s Dyke near Ruabon and looking across at Offa’s Dyke where it hits the River Dee at Ty Mawr Country Park in October, only a small section of the interview was aired, filmed on the dyke at Ruabon. The documentary was produced by AlleyCats for BBC 4, entitled: Beyond the Walls: In Search of the Celts. Historian Dr Eleanor Barraclough travels through some of Britain’s most beautiful landscapes – Hadrian’s Wall, the Lake District and Offa’s Dyke – in search of new evidence to reveal the true story of the mysterious ancient British tribes often called the Celts. According to the official history books, the Celts were defeated and pushed to the edges of Britain by waves of Roman and Anglo Saxon invaders. However, a growing body of evidence suggests this is not the full story. To help give the Celts back their proper place in our history, Eleanor examines freshly discovered treasures, new archaeological evidence from real photographs and clues hidden in ancient poetry to reveal a fresh narrative – one that suggests the relationship between our ancient British ancestors and those who came to conquer them was much less repressive, and far more co-operative, than we have thought. I was being filmed in order to talk about the early medieval kingdoms of Britain, focusing on the relationship between the Britons and the Anglo-Saxons. To do this, I wanted to talk about the Pillar of Eliseg and Offa’s Dyke, and how they afford contrasting perspectives, one ‘Welsh’, one ‘Saxon’, on the Christian kingdoms of the Early Middle Ages. I won’t evaluate the programme, but make of it what you will. All I can say is that I did my very best to articulate the stories of two complex monuments, and they gave me every opportunity to make my points as clear and coherent as possible. Whether I do make sense remains my responsibility, not theirs, despite being heavily edited! Certainly, this was my first time working on a TV documentary in a decade and it was a very positive experience for me to get to work with David Starkey and Alfie Turner from AlleyCats. In doing so, I got to represent my work on Project Eliseg and my work with the Offa’s Dyke Collaboratory. even though I’m very disappointed that the Pillar of Eliseg didn’t make the final cut. Still, I was delighted to be able to talk about two monuments that should be regarded as key to the study of early medieval Britain, and yet which rarely feature on television documentaries. The choice not to discuss the Pillar of Eliseg was odd. I had discussed some ideas to appear in the forthcoming Project Eliseg monograph. I addressed the complex biography of the early ninth-century cross, including its form and text. I also considered how the monument operated in its landscape setting, and how and why the monument reused a prehistoric cairn. Most importantly, I identified how the monument was positioned in relation to, and perhaps in defiance to, the Mercian linear earthworks to its east. Regarding Offa’s Dyke, I addressed how it was positioned in relation to the Vale of Llangollen and the River Dee. I then talked about changing views on its functions and significance as a part of the Mercian frontier, and its legacy to this day. What I hope the programme shows, even though the Pillar and the Dyke should/could have been discussed together, is the complex and fluid relationships between the British and the Anglo-Saxon kingdoms: a ‘prehistory’ to the March of Wales as it developed following the Norman conquest of England. It was a pity that the equally significant Wat’s Dyke couldn’t be featured, especially in relation to the Pillar of Eliseg. Still, for a 29-minute programme, I think packed in quite a lot of new and interesting research! Many have commented to me that, even for abbreviated TV shows, it seemed far too rushed. Adapted from Howard’s Archaeodeath blog. Around Wrexham, Wat’s Dyke remains an important monument but heavily damaged by agricultural, industrial and construction activities. Running c. 38 miles from Basingwerk to Maesbury, it is a monument often overshadowed by its larger neighbour: Offa’s Dyke. 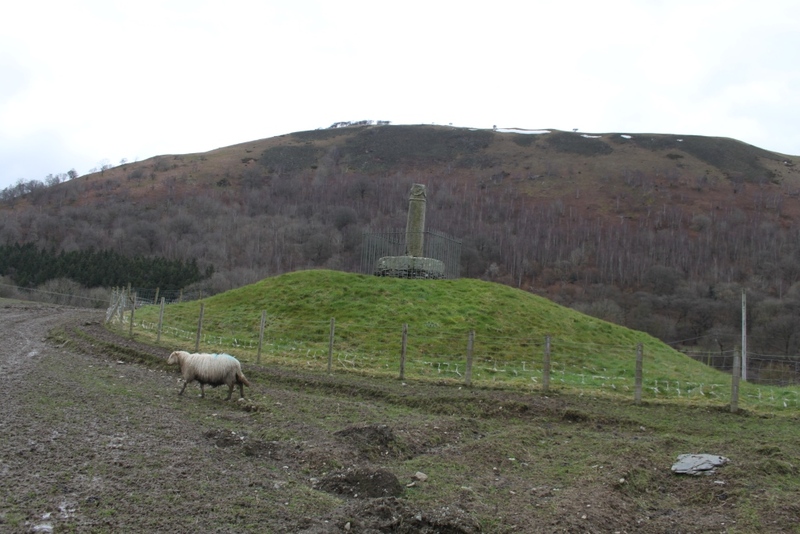 Excavations at Gobowen suggest that it is later than Offa’s Dyke: a Mercian construction of the early 9th century AD. At Pandy, as part of a recent field trip exploring the industrial and post-industrial uses of the landscape, I encountered a section that runs from near the railway line across the fields towards what is now the A483, before it enters into what is now the suburbs of Wrexham. See my previous discussions of it at this location here, and nearby at Erddig here and here. Fox, writing in Archaeologia Cambrensis in 1934, has this to say about the section. Wat’s Dyke begins again 50 yards to the S. of the “Y” road junction, near Pandy Farm. (From this point northwards to the road, there is a mere hedge bank). The construction of the railway obscured the topography, but it is clear that the terminal point is exactly what was the head of a lateral (and doubtless boggy and thickly wooded) ravine opening northwards down Wilderness Wood to the main river (see Fig. 26, 5, a). From the very beginning, the Dyke was straightly aligned (Type I) to the 300ft contour, 620 years away, and was throughout on a large scale with a broad W. ditch present-day irregularities are due to destruction and levelling. While the bank is denuded, it is clearly larger than any later field boundary, and straight-aligned with extensive views westwards. Moreover, nothing more than a wide depression running west of the bank, it is evident that a large ditch once existed on the dyke at this location. In this position, Wat’s Dyke is not following the top of a ridge or ravine. Instead, it is running as straight as possible over relatively flat ground in order to navigate between the Alyn and the Clywedog rivers. To the south, it crosses the Clywedog before following the eastern ridge of the Black Brook past Erddig Hall. To the north, it crosses the Alyn and incorporates the earthworks of Caer Alyn hillfort. We also encountered an inquisitive horse! This isn’t precisely about Offa’s Dyke, but it is some of Howard’s musings about a site not far west of the Dyke, reposted and adapted from Archaeodeath. I want to bring things down a key with this next post. I focus on the archaeology and folklore of an archaeological site I visited when in South-East Wales last year: Harold’s Stones, Trellech, Monmouthshire. These three megalithic stones stand in a line south-west of medieval and modern settlement of Trelech, just east of a stream and close to springs. This rare stone arrangement is intriguing and evocative: I’ve only previously addressed anprehistoric standing stone alignment once before for the much-larger and widely spaced Devil’s Arrows. The Trelech stones tip at different angles on a gradual hillside, the middle and north tip slightly westwards, while the tallest and southernmost has a striking lean eastwards. Indeed, Elizabeth Whittle (1992) described their collective impression as being ‘drunken’. The stones are set on a NE-SW alignment. Each stone is over 2m tall: with the largest to the south. They are each comprised of conglomerate puddingstone. The central stone might have been shaped by human hand, and has two cup marks on its south side. Coflein tells me that geophysical survey around the stone revealed traces of medieval or later structures and a c. 40m diameter subrectangular ditched enclosure (presumably undated). Further images can be found on the Megalithic Portal. So these are prehistoric standing stones, presumably of late Neolithic/Early Bronze Age date, and perhaps part of a longer alignment and other monuments, now lost. I recognise the standard later association with the Devil in folklore: namely that they were thrown from the Sugar Loaf mountain by Jack o-Kent – a giant, when playing pitch and toss with the Devil. Such satanic associations tend to be of early modern in origins. Yet there seems to have been more to these stones in the medieval mind than devilish connections. The place-name ‘Trelech’ means the ‘settlement/village of the stones’. This suggests that the vicinity was defined by these prominent triad of megaliths that acquired the roles of prominent landmarks and perhaps also the association with rich now-lost fables. Why Harold’s stones? Before getting one in the eye, Earl Harold Godwinson of Wessex and then Hereford too, defeated Gruffyd ap Llywyelyn in 1063 and thus continued his rise to power as a war leader. At some unknown point, these three stones could have been ascribed to Harold’s victories in battle, and more specifically, that each stone commemorates a chieftain slain/defeated in battle by Harold. I’m still intrigued by the possible and specific association of the Trelech stones with the man to briefly become King of England and died at Hastings in 1066. All are single isolated standing stones, two in coastal locations, the third not far from the sea. Given the far-west location of this cluster, their association with the victories of Harold over the Welsh in the 1060s doesn’t seem very likely. However, they might well be connected to the travels of Harold and his fame. The logic of this cluster might lie less in 11th-century events and more than the extensive settlement of Normans, Saxons and Flemings during the 12th/13th centuries. Could these groups have been prompted to attribute ancient stones in the west Welsh landscape with earlier invaders of famed reputation? Might such an explanation work for Trelech? Certainly, but perhaps there’s more. The triad of stones at Trellech is more logically located in relation to sites of potential Saxon-Welsh conflict. Trelech is located just west of the Wye and thus the line of the eighth-century linear earthwork – Offa’s Dyke. Hence, the feasibility that this is the site of a battle, or became equated with a series of epic conflicts between the West Saxons and the Welsh, is persuasive. Moreover, using the Pillar of Eliseg as an analogy, perhaps the stones served as a regular assembly place before and after such conflicts. What is perhaps important from a Welsh perspective is that any memorials attributed to Harold would commemorate a powerful aggressor, but one who eventually met their doom in a cataclysmic fashion in the field. Such an association might have been more powerful than any positive megalithic attribution to a legendary Welsh ruler. I’m not saying that we can believe these stones marked an assembly site, a battle site or a burial site of early medieval date. However, I do propose that sometime in the 12th/13th centuries, they may well have become linked to a legacy of Harold’s impact on the Welsh landscape, and the deeds of his enemies, as much as to Harold himself. These stones might have thus served in discourses of resistance to the Saxons and Normans with this attribution, as much as ‘colonial’ monuments, in a complex and fluid Anglo-Welsh borderland. There is a metal Ministry of Works-style sign, but actually it is far more recent, dating from the Cadw era (1986, i.e. post-1984). It is just decidedly ‘retro’. A more modern yet faded heritage board by the gate. It speaks of the archaeology and the legendary associations. A further heritage aspect is that the gate is itself commemorative: a threshold enforcing association between stones and heritage organisations. In summary, this is a fascinating site and well worth a visit. The potential of early medieval activity of some sort at this location – assembly, battle, burial site – and thus inspiring the Harold attribute, remains a temptation. Whether so or not, the Harold association does suggest a now-lost specific story linked to Harold Godwinson and circulating in the area in the Anglo-Norman period. Whittle, E. 1992. A Guide to Ancient and Historic Wales: Glamorgan and Gwent. Cardiff: Cadw. In October 2018, Dr Caroline Pudney and the final-year students explored sections of Offa’s Dyke. Having visited Montgomery Castle and then Dudston Fields, we headed north to explore a very different topographical situation for Offa’s Dyke. The only similarity is that here, again, Offa’s Dyke follows the modern Anglo-Welsh border. As we headed north from Dudston Fields, we saw the dyke at key points including at Llanymynech where it heads for an Iron Age hillfort on a prominent hill having negotiated the Severn valley, and later on we saw it dramatically situated at Baker’s Hill and Carreg-y-big. We then walked a section of Offa’s Dyke from Craignant south up onto Selattyn Hill. In contrast to the wide open vistas of the Vale of Montgomery, here Offa’s Dyke navigates steep topography as it jumps across and blocks tight valleys in the Welsh uplands. The line of the dyke was clear here, we could see how it bends eastwards as it descends into valleys, so its concave line more effectively overlooks and impresses those approaching from the west. This is a feature Ray and Bapty (2016) identify. We then followed it as it skirted the western edge, rather than attempted to reach the top, of Selattyn Hill. We also discussed how you have fairly restricted views westwards from the dyke, contrasting with the situation at Dudston Fields. However, the significance of its line in navigating this more challenging terrain might have instead come from strategies of communication along the dyke’s line, rather than an ability to surveil extensive vistas west. Furthermore, as I’ve suggested before on Archaeodeath, the dyke in this area controls stupendous views eastwards, and the hills immediately behind it to the east might have served as beacons affording communication over 40 miles across the Cheshire and Shropshire plains. The composition and design of the dyke differs here too. It is less monumental than at Dudston Fields. The dyke has to be dug into very different geology: here it is stone and must have been very difficult to excavate. The bank is smaller, and the ditch seems less broad, meaning it might have been deep but steep. Another point of interest is that the rise up from Craignant reveals demonstrable scrapes that might be unrecorded primary quarries, used to excavate stone to face the dyke. It might have originally been dressed to appear like a drystone wall: a point suggested (again) by Ray and Bapty. An additional point of interest is the proximity of the dyke to a seemingly prehistoric cairn, although I’m not suggesting any precise connection to the dyke. The section at Craignant allowed us to identify the later commemoration of Offa’s Dyke: the notable Craignant tower. This is a 19th-century folly affording the dyke with a fortified Gothic appearance. Finally, we discussed the role of the Offa’s Dyke Path, and we met walkers enjoying it. The walk gave us a clear sense of the dyke as a long-distance footpath, and the signs revealed its intersection with the Shropshire Way.